President Namadi Sambo at the Presidential Villa. 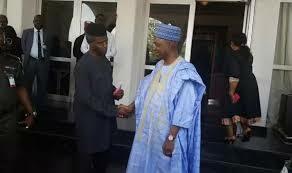 It is interesting to note that Sambo, was vice president to ex-President Goodluck Jonathan, in his office in the Villa. Details of the meeting were however not disclosed to journalists. However, prior to his meeting with Sambo, Osinbajo had earlier in the day presided over the Federal Executive Council meeting.